Day 5: May 2, 2015. An early start this morning. 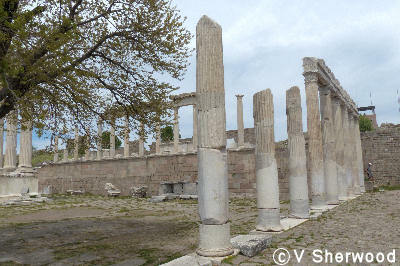 We took the bus north to Pergamon, then had lunch in the modern city of Bergama. We were looking forward to seeing the original site of the Zeus Altar which is now in Berlin. We saw it in the Pergamon Museum in East Berlin in 1973 when the city was still divided between East and West. 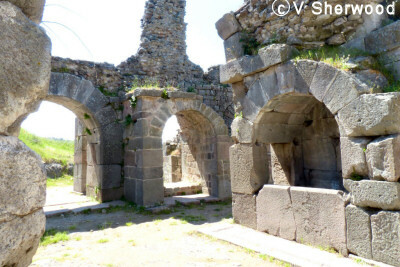 Pergamon is divided into two levels. The ordinary people lived down in the valley. 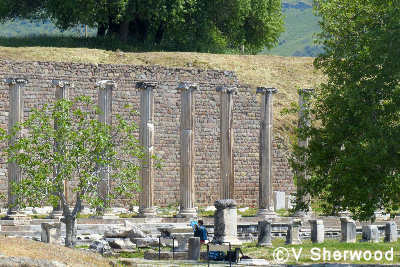 The Asclepion, an ancient health clinic dedicated to the god of healing Asclepios, is also on the lower level. Up on top of the hill is the Acropolis and the homes of the rich and influencial. Fortunately there is a cable car, so we did not have to climb up the hill or walk down it. . This afternoon we will set sail for the Greek island of Kos. We have really enjoyed Turkey. This is a map of the Asclepion in Pergamon. 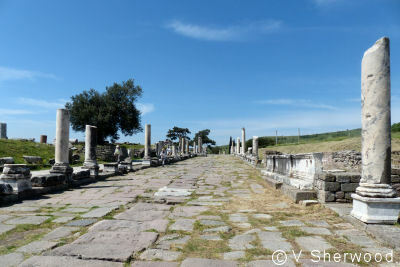 This is the Sacred Way, the street leading into the Asclepion. It was once lined with shops and monuments. The Acropolis of Pergamon from the Sacred Way. 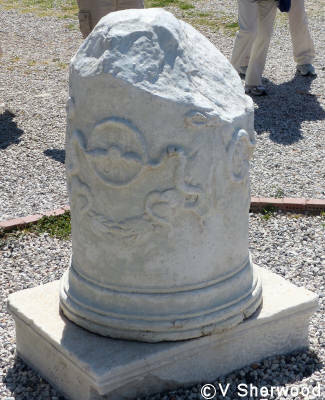 This broken column stands near the entrance to the Asclepion. The 2 snakes across a wheel was the symbol for the ancient centre of healing. As snakes shed their skin, patients would shed their diseases and become healthy. 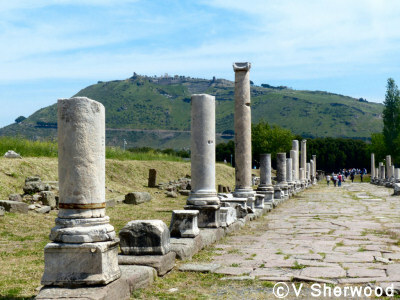 The Pergamon Asclepion was one of the most famous centres of healing in the ancient world, expecially under Galen (129 to 216 AD) who was born in Pergamon and studied in Alexandria, Egypt. Niches in the Asclepion where patients spent the night, hoping that they would dream about what was ailing them so the doctors would know how to treat them. 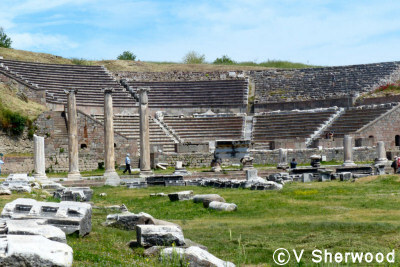 The Asclepion also contained a theatre. It was believed that the mind as well as the body should be treated to cure the patient. The North Stoa beside the theatre. 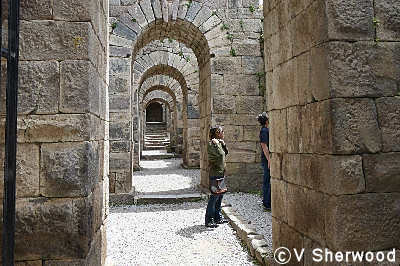 The stoa was a covered walkway where patients could walk and talk out of the sun or rain. 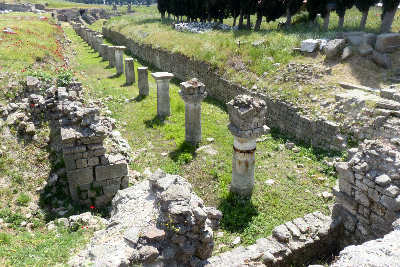 The foundations of the West Stoa. These columns supported the floor. 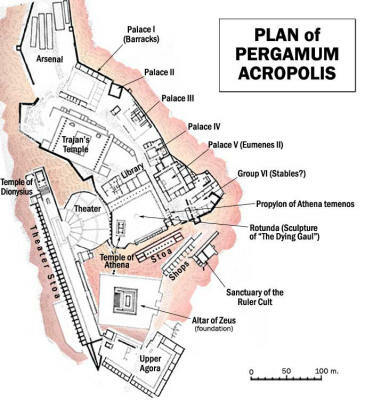 This is a map of the Pergamon Acropolis where the main public buildings were situated and where the wealthy lived. 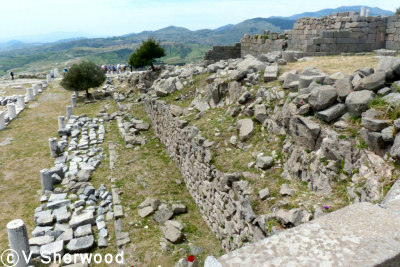 Water was brought to the Acropolis by an ingenious aquaduct and syphon system from springs on a nearby, higher hill. 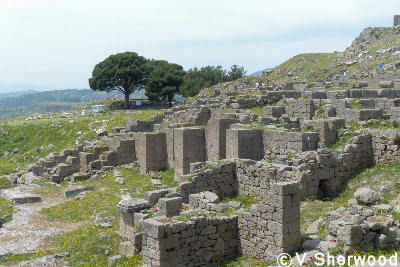 In the foreground are the ruins of the stoa and shops. 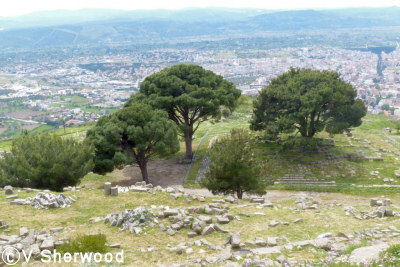 Behind is the site of the great Altar of Zeus. 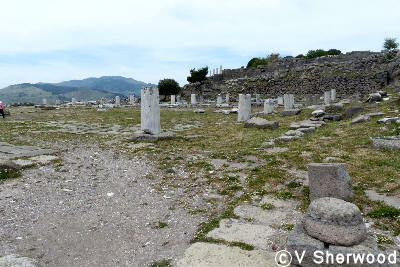 This is what is left at Pergamon of the Altar of Zeus. 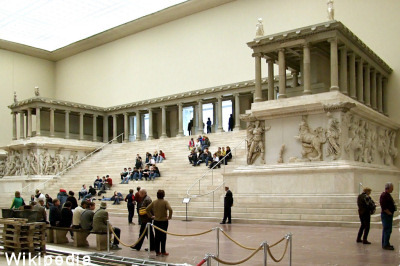 This is the great Altar of Zeus in the Pergamon Museum in Berlin, Germany. It is really magnificent. The Sanctuary of Athene where the statue The Dying Gaul was found. Behind it are the ruins of the Library and on the skyline the Temple of Trajan. 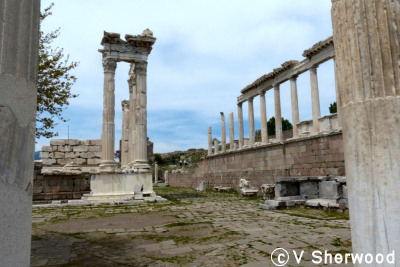 The ruins of the Pergamon Library which was second only to the Library of Alexandria in Egypt. It is said that it held 200,000 scrolls. When Egypt put an embargo on sending papyrus to Pergamon, the Pergamenes invented parchment (charta pergamena) made of sheep and goat hides. Next to the Library is the Temple of Trajan. Massive walls support its terraces. The arched foundations supporting the terrace of Trajan's Temple.